Zamora, a charming province in northwest Spain, hallmarked with Romanesque structures, historic fortresses and the quiet solitude of nature, falls outside the usual Castilla y Leon tourist trails. The superb Queso Crudo Oveja Ciudad de Sansueña (Raw Sheep Cheese of Sansueña City) has been largely unknown beyond its area of origin until only recently. For over three generations Lacteas Zamoro has been making authentic Sansueña in coordination with local farmers. This artisan cheese is tangibly likened to an aged, more-mellow Manchego, but only sampling will fully reveal its distinct regional flavor qualities. 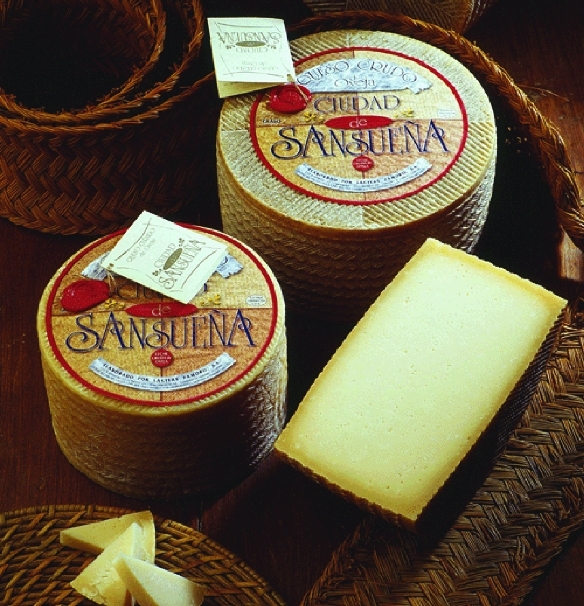 Sansueña’s fermentation is achieved solely from the raw milk’s natural bacteria; no yeast or preservatives are added. After being hand pressed and molded, 11 months of curing affords Sansueña a straw-colored interior and a dense yet sheep’s-milk creamy, smooth texture. Once one of Spain’s best-kept secrets, Crudo Oveja Ciudad de Sansueña is now available for a world of new palates to enjoy. Applications: Divine simply on a cheese platter surrounded by fresh fruit, Sansueña Artisan Raw Sheep’s Milk Cheese is also excellent for cooking. It is perfect shredded and incorporated into a lightly fried croquette with Serrano Ham and served alongside quince paste, or for traditional Spanish egg, onion and potato tortas. Pairings: The rule of thumb when pairing wine and cheese is “keep it local”. In the case of Sansueña, the nearby area of Toro produces some of the best, most concentrated red wines in Europe. These Tempranillo based wines make a perfect foil to Sansueña’s full flavor. The golden-yellow quince fruit is a relative of the apple and pear and native to the Caucasus region between Europe and Asia. This unique fruit is typically cooked to yield a sweet, candied paste called membrillo. 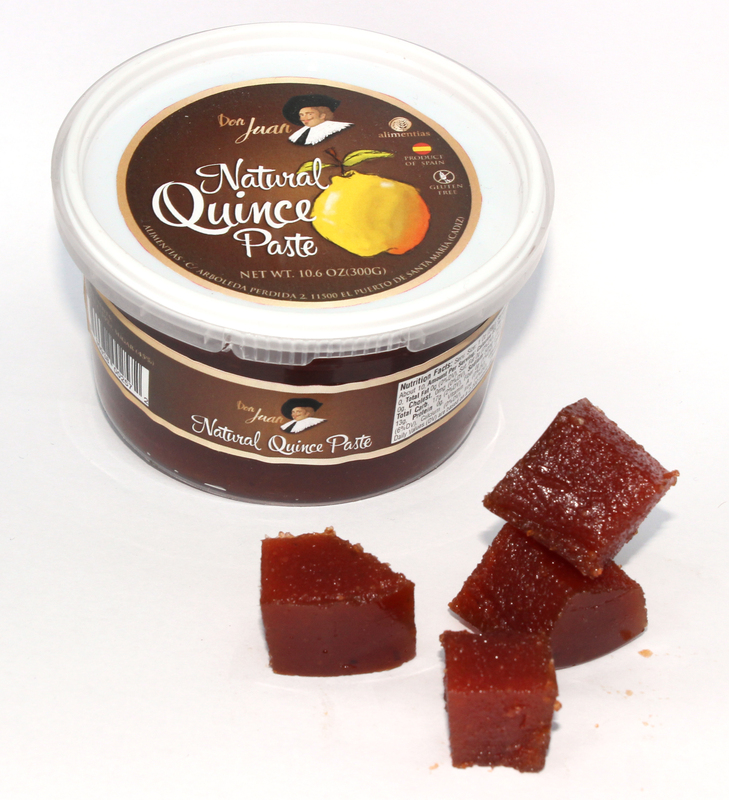 Don Juan quince paste is hand crafted in Malaga, Spain using artisan techniques with only the highest quality fruit. No additives, preservatives or artificial colors are used in production. This traditional Spanish snack features a sweet floral bouquet, slight tang and delicate overtones, making it an ideal complement to cheese. Don Juan Quince Paste often complements cheese, offering a sweet contrast to the savory flavor of traditional Spanish cheeses, such as Manchego and Cabrales. This fruitful paste is also perfect to serve with ham, roasted meat or baked fish and as a spread on toasted bread.